This eye-catching reversible silver pendant is an Indalo, etched on the matt front, to create a sparkling effect in the light, and shiny on the back. The Indalo is well-known in southern Spain as a symbol of protection and good fortune. People who are lucky think positively, look for opportunities and are always open to possibilities. Remind your friends or loved ones to be lucky and positive by sending them this unique and meaningful present. It is the ideal gift for any special event or occasion, or to show someone you are thinking about them. 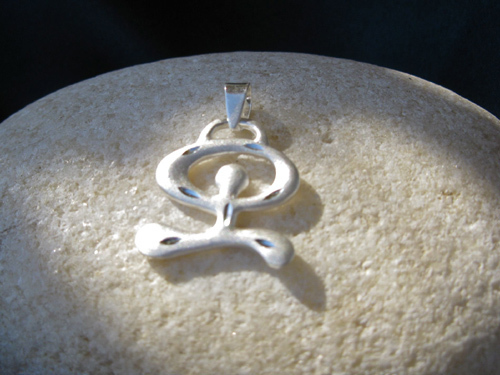 Dimensions: The pendant is etched on the matt silver side and shiny on the other, and measures 22mm in length including the hanging bail by 18mm in width. Please note that no chain is included (although we can supply chains separately). Everyone needs a guiding spirit to help them through life's challenges. Let this lucky silver Indalo help. Comes gift-wrapped, like all our presents (with an information card about the Indalo) - and we can print a personal message on your behalf.